Elegant and understated in style, these cast metal address plaques are finished with a coating for a real crushed stone appearance. Features a classic rectangle shape, neutral color scheme, and tough all-weather powder coat finish. 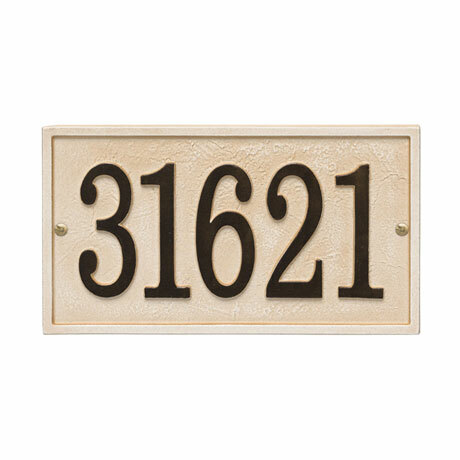 Measures 11" W x 6.25" L x 0.25" H. Specify personalization up to 5 numbers - no letters allowed. Comes ready to install with screws included. Made in the USA. Please allow 2-3 weeks for delivery. No rush delivery or gift box.